Once you have your bike in tow, you are ready to hit the road for your trip. Whether you are having a vacation with your family, or you and some of your friends want to have a fantasy trip you have always wished for, and you need bikes for your R&R. This means you would be needing a bike rack. If you delve into the bike rack market, you would discover that there are loads of choices you can easily select from, but they are all not the same and the quality is totally different. We would be ranking the best hitch bike racks in 2019, exposing what makes them different from each other, Pros and Cons of each bike rack and what makes each rack unique. We all can agree that trying to discover the best bike rack which would give you quality returns for the money you would be paying could be quite tasking, time-consuming and would also cost more. Due to this reason, we have taken time to review the best 10 hitch bike racks available. 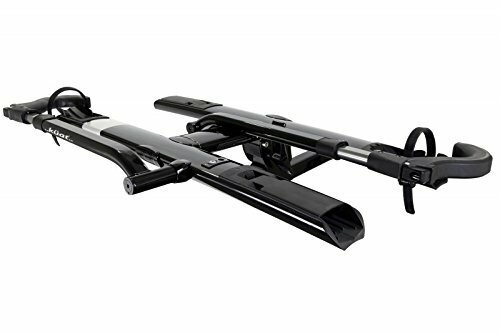 Fortunately, the Allen Sports Deluxe 4-Bike Hitch would be the only type of four-bike hanging system which would make it to our ranking. The performance of this rack has been rated top notch by regular users. This hitch bike rack has plenty of space for at least five bikes, and each bike has its own cradles on each arm. The rack also has a feature of the Allen Sports innovative tie-down system which helps to secure the bike while in transit. It should be noted that this rack works only with two-inch hitches; the class III and class IV. The installation is quite simple and easy, it also takes some few minutes, depending on how fast the person installing it is. 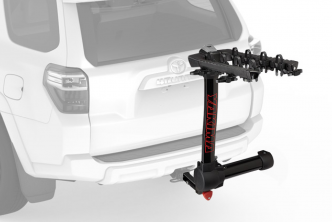 The rack easily slides into the hitch which has already been mounted on your vehicle. It is easily fastened with a nut and bolt. Anytime it is out of use, the arms would easily fold out of your way. Even when the rack has been loaded, it tilts outwards with the removal of the locking pin, which would give you access to the rear part of your vehicle. The rack is made from steel, and it has a durable powder coated finish which comes with a lifetime warranty from its manufacturers directly. It requires a little bit of assembly, but this has been considered and the required tools would be shipped with the rack after purchase. I really cannot say about your preference, but to be honest, after seeing the Yakima RidgeBack for the first time, I fell in love with it automatically, and apart from this, its use made it completely distinct. This hitch bike rack has a distinct style which is the hanging style, and it is a worthy contender when compared with other hitch bike racks available. It can easily carry two bikes. However, if you want to carry more than two bikes, there are several versions available that extend up to the five-bike carriers. The fits receiver measures just 1.25 or 2 inches. 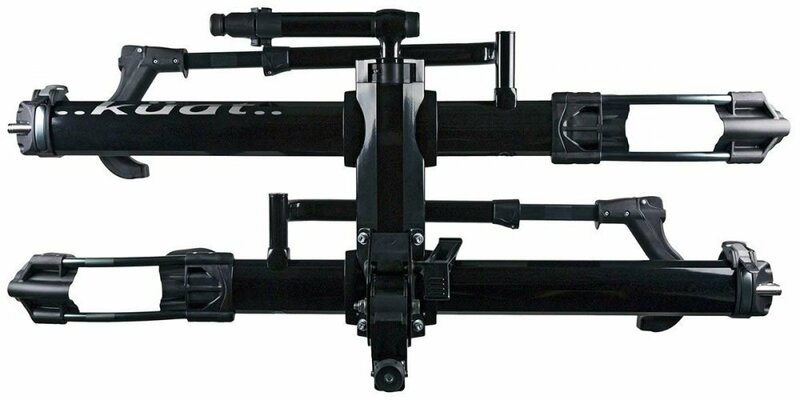 The rack has been confirmed to weigh just 32 pounds (quite light right??). This means that only one person can easily install and manipulate the rack. The rack comes with a SpeedKnob which allows you to easily mount and remove the rack in few seconds, and it also alleviates the need for pins, bolts, and other hardware. There is a lever which can be conveniently pushed to make the rack tilt down and backward, to allow easy access to the rear of your vehicle. The rack also comes with a unique ZipSecure system which gives utmost security for your bikes while in motion. There is also an anti-sway technology which helps to keep the bikes as still as possible when transporting them. Blocks the rear door of your vehicle, though it can be easily removed. 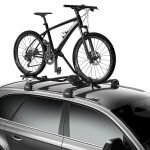 Whenever you are talking about one of the most innovative platform style hitch bike rack on the market, then you just have to talk about the Thule T2 Pro XT. This rack offers an easy mounting and also easy removal process, there is also a simple lever which would let you easily fold up the rack whenever it is not in use. This lever is multi-functional because it also allows you to tilt the loaded or unloaded rack downward for easy access to the remaining part of your vehicle. Another interesting part of this hitch bike rack is that it employs the use of ratcheting arms to help secure the wheels to the rack platform. This is just to make sure that your bike frame does not come in contact with the rack. Also, the arms can fit wheels which are up to five inches wide and about 20 to 29 inches when measuring its diameter. Only two bikes can be mounted on this variation, and both bikes can be easily mounted side by side to get a perfect fit. The security of this rack is top notch because there is an integrated cable lock which ensures that your bike is completely secure in just a snap. It should be noted that there is an option of add-on, which allows you to carry a maximum of four bikes. However, this would require a two-inch hitch. This is also another innovative hitch bike rack with wonderful features, offers convenience and boundless capabilities. This rack is a platform style rack which makes use of wheel securement to help hold your bike steady without touching the frame. There is also the feature of an adjustable front tire cradle system which helps ensure that all bikes fit perfectly on the rack regardless of their wheel size. This is another type of platform style hitch bike rack which ensures that your bike is securely held, without letting its frame touch the rack. Just like the Thule and Kuat Racks mentioned earlier, this rack also offers adjustable tire cradles, and it comes with a locking clamp which hooks over the top of the tire and this keeps your bike in place without causing any form of damage to the frame. There is also an interesting feature of the StrongArm which is designed to help to mount and securing your bike on the rack simple and really easy regardless of the weight of the bike. Another really important characteristic of this particular hitch bike rack is that there is an offer of 60 pounds weight limit per bike, and there is space for just 2 bikes. This means that there is an entire capacity of about 120 pounds for both bikes. 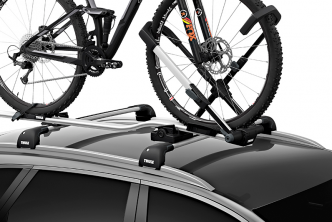 This rack also has an add-on which allows you carry up to four bikes at a go, just like the Thule T2 Pro XT. Here is another platform style rack, but this hitch bike rack comes with wheel clamps. The other racks mentioned earlier on, have their wheel clamps located to the side of the rack, but this is not the case with Saris Superclamp, because its wheel clamps are located side by side, and they are parallel to the body of the rack. This is one of the lighter racks available on the market, and it weighs just 35 pounds, but this does not have any effect on the weight of the bikes it can carry, because this rack can carry two bikes of 60 pound each conveniently. This rack is also expensive, but not bad for its price. Can carry only two bikes. This rack is sort of similar to the NV 2.0. It also utilizes a pivot system which was just redesigned and it comes with an optional foot assist. It also comes with a front tire ratchet system which is usually used to lock your bikes front wheel in place. The rear tire, on the other hand, is cradled in a molded cup for additional security. This rack comes with a no tool assembly, installation, and removal. This innovation is appreciated by most buyers, as well as the low profile design. It should be noted that this rack has been made available in three different colors which include; gray, black and pearl. The rack is made from full aluminum, and it is available in 1.25 inch or a 2.0-inch assembly. There is also additional security for the rear tire. This is a popular heavy duty hitch bike rack which has been designed to satisfactorily hold 2 bikes securely while in transit. It has a wheel stirrup on both sides, with individual tie-down straps for each stirrup, and also a locking hook for the bikes. It should be noted that the hook fits over the frame of the bike, not over the wheel itself. The hook is covered with soft grip materials to prevent any metal to frame contact which would cause potential damage. The stirrups can also be adjusted to fit any bike regardless of their tire size. This hitch bike rack has the capacity of holding bikes with wheels sized 20 to 29 inches, and each bike has a maximum capacity when it comes to weight. Each bike cannot weigh more than 35 pounds and a total of 70 pounds for both bikes. It should be noted that this rack can fit 1.25 inch and 2-inch hitches. Another interesting feature about this rack is that; it has push button ratcheting arms, and there is also a limited lifetime warranty courtesy of the manufacturers. Cannot take more than 70 pounds. This hitch bike rack gives you the most effortless way to transport your bikes. 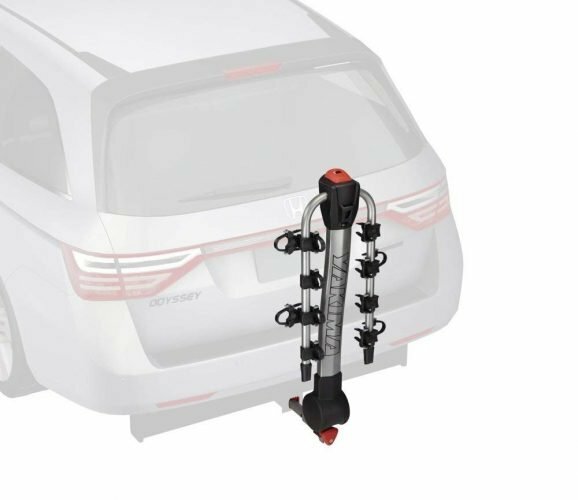 The hitch bike rack has also been designed in such a way that it is quite easy for you to access the rear door of your vehicle, without having to detach the rack from the vehicle, this is because of the backward design feature. There is a three-point connection system, two tray style arms at the bottom of the rack and another vertical arm on top of the rack. This is just to help you keep the bike from swaying while driving. Bike swaying while in transit, would affect your driving negatively. The rack has amazing features such as; the foldup design, with this design the user can fold up the rack whenever it is not in use, and this would effectively save space. There is also the safety reflector, which helps to enhance visibility and ensure safe night driving. A solution has been created for the wobbling that always occurs between the rack and the hitch. The Anti-wobble design is the solution provided to this problem. The rack comes with tray styled loops and padded arms, which would not only hold your bikes firmly, but the padded arms would also help protect your bike frame from any form of scratches. 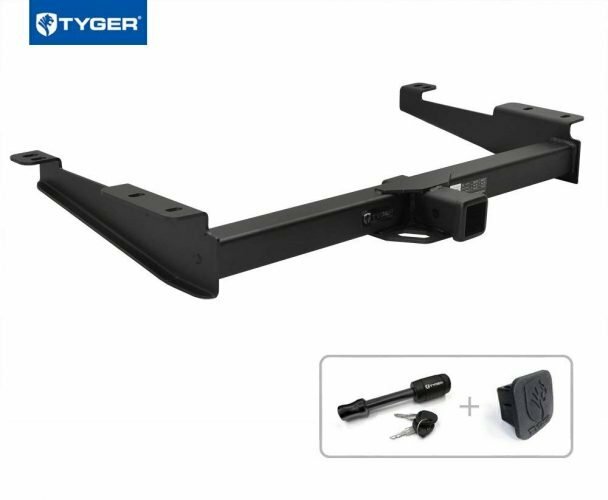 This is a universal hitch mount hitch bike rack made by Tyger. This is a 4 hitch bike rack which as hitch pin lock and cable lock. This is a handy and trusted bike carrier. It fits all types of dual-arm bikes on vehicles which have been equipped with either a 1.25 or a 2-inch hitch receiver. This rack is made up of heavy duty 2.5-inch marine grade stainless steel tubing frame in a mirror polished finish, just for the rack to be rust resistant and make it have a customized look and seamless welding for a sturdy structure. Riding a bike is a wonderful experience, without even owning a bike. Owning a bike can be likened to the experience you would feel when you purchase your first car. Your bike would easily take you to wherever you want to go, but the only thing you would be required to do is; PEDAL! However, if you wish to go further with it, you would need to find a way of transporting your bike with you on your vehicle. This is where hitch bike racks come in. hitch bike racks are perfect for situations such as this. However, there are several types of hitch bike racks available on the market, these bike racks are however different from each other when critically compared, just like we have done above. If your vehicle has a trailer hitch, or you have been considering purchasing one for installation, this means a hitch bike rack is the most simple and convenient option you can go for. Whether you are a first timer in the hitch bike rack market or an oldie, most people often get overwhelmed when it comes to doing research about the hitch bike rack that fits their needs and budget. There are different types of bike racks in the market, such as; roof racks, truck racks, hitch racks, spare-tire racks, and many more. These types of racks totally differ from one another and they all offer unique benefits, though they also have their disadvantages. These been said, what is a hitch bike rack? 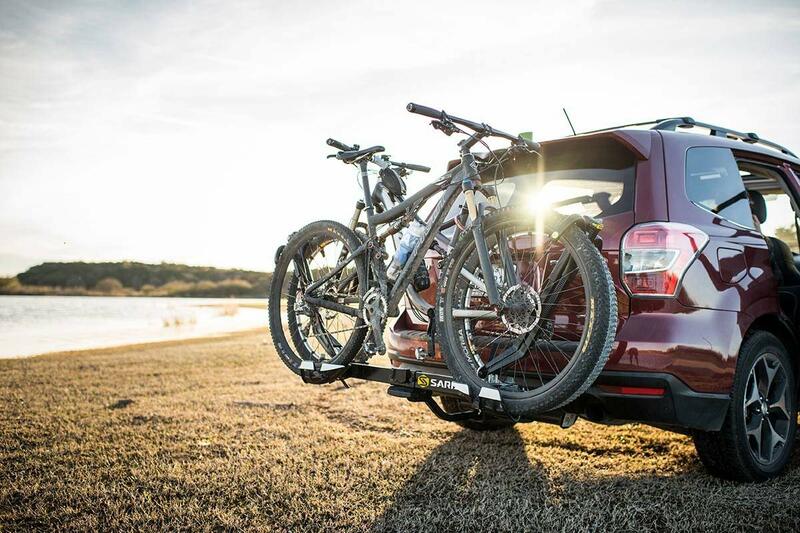 A hitch bike rack is attached to your vehicles trailer hitch. You remove the ball and hitch and install the rack into the receiver. They would lock firmly in place with a nut and bolt, as well as safety chains. The rack could be L-shaped, or straight. This largely depends on the rack model you have purchased. The rack can also hold maximum of one to four bikes, this also depends on the racks configuration and capabilities. Some of these racks have saddled which the frame of each bike would rest on, and they also have straps with lockdown tabs which would allow you to keep the bikes securely in the right position. Some hitch bike racks employ the use of Velcro in addition to tension tabs. You would also discover that there are advanced and basic hitch bike racks available on the market. The simplest rack available on the market would give you the basic feature of carrying your bike securely, but it would likely deny you access to the rear or tailgate of your vehicle. More advanced types of hitch bike racks come with the swing out feature which allows you to fold the rack downward or to the side. 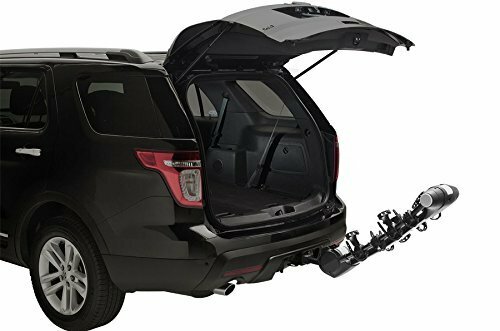 This way, you can easily access the trunk, rear or tailgate of your vehicle. After you know what a hitch bike rack is, the next question which might come to mind is that; why would you choose this particular style over the remaining styles available? It should be known that there are different types of bike racks available on the market, why then is hitch bike rack a better choice than others? 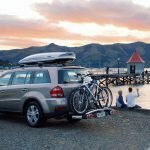 Why should you choose a Hitch Bike Rack? Why should you give hitch bike rack consideration over a roof-mounted bike rack or a strap-on rack which would easily fit across the back of your vehicle? There are some reasons for this and they shall be discussed in this write-up. Carrying Multiple Bikes: A really important reason to consider a hitch bike rack over other types of rack such as roof rack or a truck rack includes; a hitch bike rack can carry two bikes at a go, but most times, that is the limit. However, you would find some hitch racks on the market which can carry three or four bikes at the same time, without putting either the rack or the bikes in danger. No Worries about Loose Straps: Some bike racks if not almost always require straps for you to tie the rack to the vehicle. This is really evident especially with strap based system which would fit over the back of a minivan, or over the back end of your trunk. This is not a totally secure system of transporting your bikes, because the bikes are only as secure as the straps used to hook them in place and the person that actually tied the strap to the car. If a strap is loose, or there is a damage to one of the straps behind the securement hook, this would mean total disaster for your bikes, and if the worst should happen while you are on the road, it could cause an accident. Keep Your Vehicle Clearance the Same: Even though roof racks allow you to carry two bikes, there is a standard which must be adhered to and that is; the bikes are required to remain in an upright position. This would add to the height of your vehicle, and can put you in danger of encountering low-clearance obstacles, especially with restaurants that have drive-through lanes and many more like that. No Need to Break down Bikes: Some bike racks available on the market, require you to remove at least the frontal wheel of your bike, in order to secure it within the rack. This would consume more of your time and effort, and also the hassle of storing the wheels separately in your vehicle. A hitch bike rack on the other hand simply allows you to slide the bike over the racks, strap them in place, lock the bikes down, and you are on the move. Maximize Bed Space: If you own a truck, there is at least a chance that you must have considered getting a bed bike rack one point or the other. 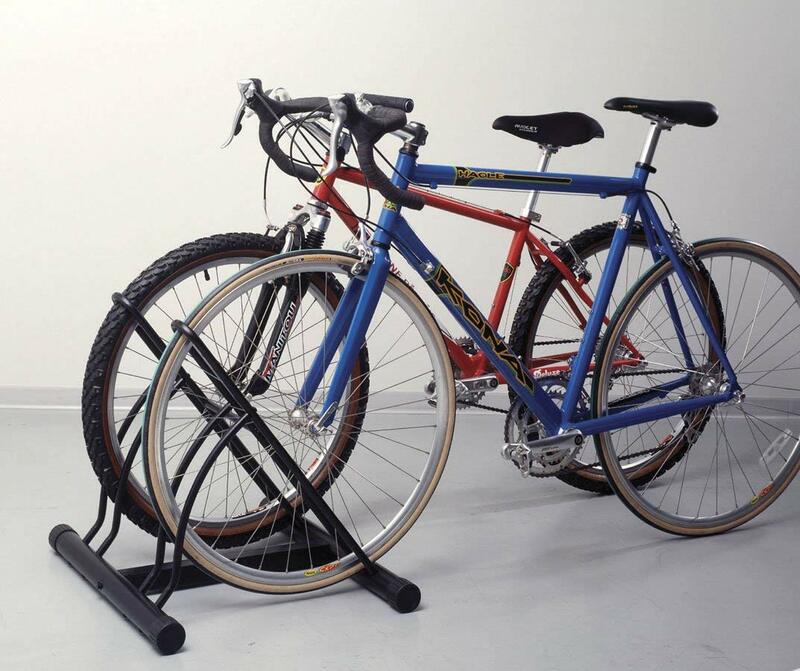 Hitch bike rack is a wonderful option, which allows you to carry your bikes upright in a more protective way. However, there are chances that this would eliminate space for storage of other items such as your luggage. This is more apparent in situations where you have shorter bed trucks or bed trucks that have in-bed toolboxes, in-bed storage boxes and lots more. Hitch bike racks let you maximize the use of your trucks bed while still carrying your bike or bikes as the case may be wherever you need to go. From the information presented above, you would discover that there are lots of reasons why you should consider hitch bike rack over any other type of rack available in the market. As you can see, there are both favorable and unfavorable things about these racks, but it is really important to have considered everything necessary before going ahead to purchase any rack in the market. These would take us to the section where we would discuss the Pros and Cons of hitch bike racks in general. Hitch bike racks offer relatively easy and convenient to use bike carrying capacity, which could fit on trucks, minivans, SUVs and some passenger cars also. However, there are advantages and disadvantages to these racks, and it is really important that you should be able to make accurate decisions based on all the information given and more to come. Often more stable than other types of bike rack: Hitch bike rack is usually stable than other forms of bike carriage mechanisms which are available in the market, and this is one of the reasons why it has an upper hand. Simple Installation: When comparing the installation process with that of other bike racks available on the market, it would be discovered that hitch bike rack has one of the simplest installation methods. 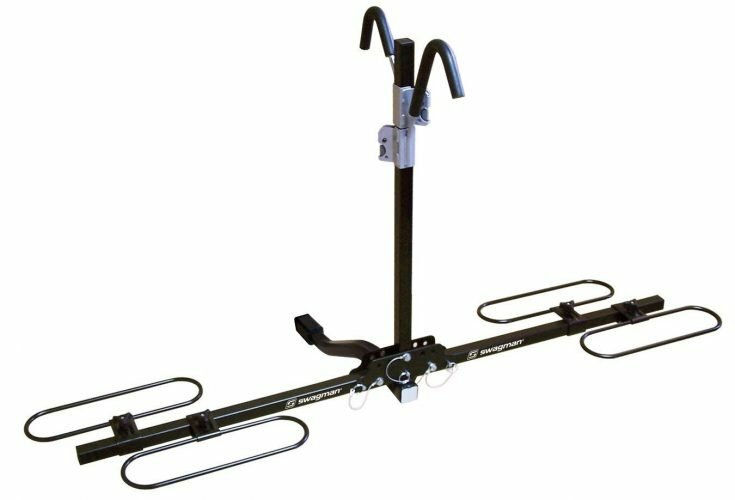 Easy to mount and remove bikes: When it comes to mounting and dismounting bikes, hitch bike rack would not fail you. It is really easy to do this. The bike rack has been designed in such a way that the comfort of its users is the top priority. Can carry more bikes than other rack options: Hitch bike racks has the ability to carry more bikes than any other bike rack available on the market. If you wish to carry 4 bikes, there is the hitch bike rack for that. If you wish to carry 3, there is also the model for that. Unlike most bike racks that can carry just one with a maximum of 2 nothing more. A wide range of styles available to fit your needs, budget, and vehicle: There are loads of styles available which would fit your preference perfectly, all you need to do is do the right research and pick the one which fits your criteria most and you are good to go. Advanced functionality available: Though not all racks can do this, but some racks have the feature which allows you access to your rear/tailgates/trunk doors, and this is just at the push of a button. This is the only available bike rack that allows that. Strong and durable enough for constant use: This type of bike rack can be used more than once, and this is due to its durability. Unlike other types of bike rack that you would have to dispose of after the first use. Available in both hanging and platform style: Hitch bike racks are available in either hanging or platform style, and they have been differentiated earlier on, you just need to select that which suits your preference. Can be expensive, particularly for larger capacity racks, or racks with more advanced features: This bike rack could be quite expensive, especially for the more advanced racks, but if you do not mind the price, and all you require is quality, you can go for this type of bike rack. 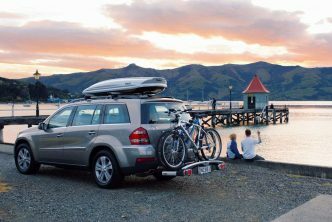 Requires that your vehicle has a tow hitch: One of the requirements of a hitch bike rack is that your vehicle must have a tow hitch where you would attach the rack too. However, there is nothing to worry about if your vehicle does not have one, because you can easily attach that to your vehicle. Only usable with class II and higher hitches (no class I): another disadvantage that people have failed to reckon with, is that this type of bike rack does not work with class I hitches, only class II and higher. Most users have complained about this after purchasing the rack. That is why it is better to discover this before purchasing the rack. Bikes often sway back and forth, which would affect your driving: Though measures have been taken to curb this, it has not been totally successful. 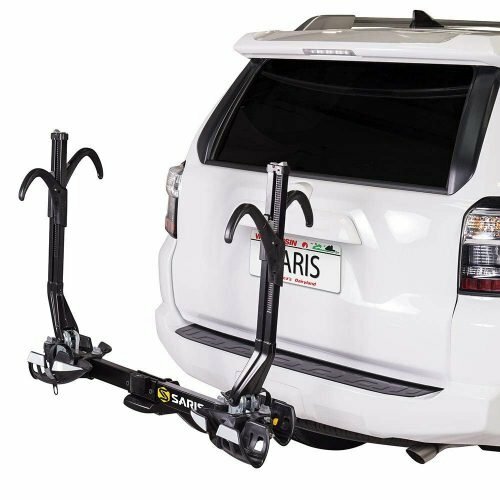 The bikes mounted on your hitch bike rack often tend to sway back and forth, this would definitely affect your driving negatively, but with the appropriate caution and speed, there would be nothing to worry about. Low cost, basic racks may prevent you from making use of your trunk, tailgate or hatch door: There are some types of hitch bike racks which would prevent you from making use of your hatch door, this is common among the low-cost racks, racks with multi-functions do not really give this kind of worry, because they easily get out of your way at the push of a button. Your hitch may have a stop hidden within it that prevents the bike rack from being fully inserted: Some bike racks have a stop sign which would prevent your bike rack from being fully inserted into the tow hitch. 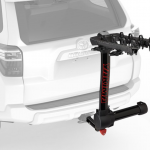 Adds to the length of your vehicle, which may make it more difficult to maneuver in some instances: The rack adds to the length of your vehicle and prevents you from easily maneuvering your vehicle. This could be a very big deal when you are stuck in traffic, and you are desperately trying to maneuver your way through. This bike rack can compromise your visibility because it would totally cover your rear/back window, and these would push you to depend on your side mirrors often. As you would discover above, that there are advantages and disadvantages. However, it is quite important to note that they do not totally apply to every situation. Some people might not have any problem with the fact that the bike rack adds to the length of your vehicle because they are already used to it. There are vehicles that come with already installed hitch by the manufacturer, this means you already rely more on your side mirror than your rear view mirror, this might also not be a disadvantage. Hitch bike rack is not the only available type of bike rack in the market. There are other types, which includes; Roof mount racks, Trunk mount rack. Just as the name implies, the roof mount rack is mounted on the roof of your vehicle, while the trunk mount rack is always mounted on the trunk of your vehicle. This racks shall be compared with each other and then you can select the best by yourself. It is true that hitch bike racks are expensive, this does not apply to only this rack, the other types of racks available are also expensive. However, the features of the hitch bike rack make the price of the rack worth it. The rack has some indispensable features which have been mentioned earlier that most of the other racks do not have. Out of these bike racks, only roof mount racks does not limit access to your vehicle. Most hitch bike racks limit accessibility to your vehicle, but that has been adequately provided for by most manufacturers by making sure that the racks can easily be removed completely or also slide them downwards (for some racks) whenever you need to access the rear of your vehicle. The trunk mount rack does not have this feature, you would need to completely remove the rack completely in most cases, and this is not quite easy to do. Most hitch bike racks require little or no installation at all. This, however, is not the same as the other types of bike racks available. Most of the roof mount racks available are always difficult to install, the same goes for the trunk mount rack. Most models of the hitch bike rack are easy to set up, with Do It Yourself instructions that are quite easy to follow, and when this is not the case in other types of bike rack models such as the; trunk mount rack and the rooftop mount rack, this often leaves buyers frustrated and confused. It is usually assumed that you would not be frequently removing you rooftop mount rack, so most of the rooftop model of bike racks are usually permanent. This racks can be described to be set it and forget it type of racks, but hitch bike rack, on the other hand, is usually easy to remove and re-install. This applies to virtually all the models of hitch bike rack models available on the market. 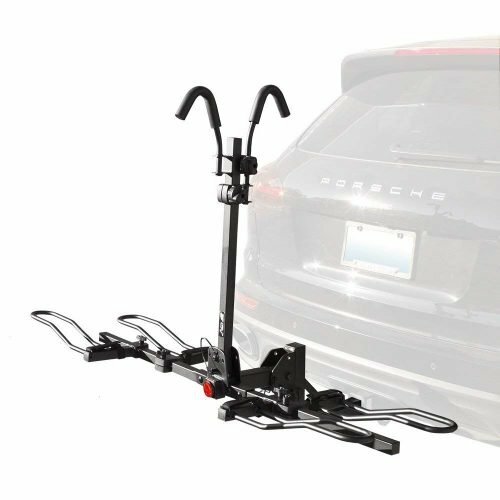 The hitch bike rack does not really require additional materials, however, if your vehicle does not come with a hitch that is higher than class I, you would need to purchase that for you to be able to make use of a hitch bike rack. Roof mount rack on the other hand always requires additional materials, and these materials are always known to be expensive. Example of such materials includes really expensive adapters and many more. Some models of hitch bike racks have been designed in such a way that they can easily adapt to any tire size of your bike, but there are some rooftop and trunk bike rack models that cannot tires bigger than 3. This does not happen when you purchase some models of hitch bike racks. Regardless of your tire size, they would always work with it. When talking about hitch bike racks, this happens to be one of the top priority. Ensuring that no damage comes to the frame of your bicycle. Manufacturers of this bike rack have devised lots of measures that your bike frame does not have any scratch on it whenever it is getting transported because of the rack. They ensured that there is enough space, and they also make use of soft cradle and protection pads just to secure your bike frame. This is not given much consideration when it comes to rooftop bike racks because most customers always complain that their bike frames have dents and scratches after transporting them. Hitch bike rack is usually stable than other forms of bike carriage mechanisms which are available in the market, and this is one of the reasons why it has an upper hand. Hitch bike racks have the ability to carry more bikes than any other bike rack available on the market. If you wish to carry 4 bikes, there is the hitch bike rack for that. If you wish to carry 3, there is also the model for that. Unlike most bike racks such as the rooftop bike rack and the trunk bike rack that can carry just one with a maximum of 2, nothing more. There are loads of styles available which would fit your preference perfectly when you want to purchase hitch bike racks, all you need to do is do the right research and pick the one which fits your criteria most and you are good to go. This, however, is not the same with other forms of bike racks that really do not have varieties when it comes to their designs. Most purchases made by customers is always done because they are familiar with the names. Most people are familiar with company names such as Nike, Apple, HP, DELL, and Samsung. However, this familiarity only ends with items that are often purchased. Loads of questions are regularly asked regarding hitch bike racks on the market, there is a very high chance that you would also have some of these questions to ask when it comes to sorting through your options. People regularly ask about how the rack works, warranty involved and lots more. Some of the Frequently Asked Questions regarding hitch-based bike racks would be addressed here. Question: Can I use a hitch bike rack without a trailer hitch? Answer: No. A hitch is required. The good news is that hitches can be purchased from most authorized dealerships, as well as through aftermarket vendors. Question: Can I use a Class I hitch? Question: How do I know what class my vehicle hitch is? Answer: Discovering the hitch of your vehicle is quite simple, this information is always in your owners manual, but the hitch could also have the class rating on a stamp, or printed on a sticker. Question: Do I need a special adapter to use one of these racks with my hitch? 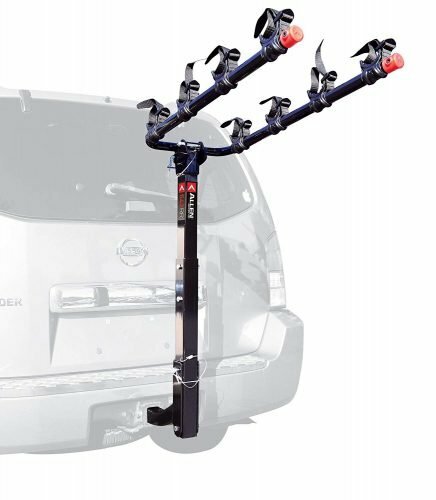 Answer: Whenever you have a class II or higher hitch, there would be no need for an adapter in other to make use of your hitch-based bike rack. It should be noted that this might not be true in all cases, as manufacturers could offer different features. However, whenever you are in doubt, endeavor to consult your rack instructions and documentation. Question: Will the bikes block my brake lights or license plate? Answer: Most racks have been designed in such a way that they do not block your tail lights or license plate, but the same cannot be said for the bikes. Whether the bikes would block your tail lights or license plate largely depends on the number of bikes you are transporting. Most bike racks would not block your brake light or license plate, but bike tires, frames, and pedals could do so. 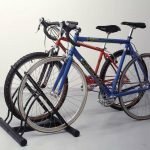 Question: Is a platform rack better, or should I buy a hanging bike rack? Answer: IT cannot be said that one is better than the other, it all depends on your needs and preference. Platform racks always have the capacity for two bikes and more, but if you want to enjoy the more feature, you would need to make use of extenders. Hanging racks, on the other hand, can carry two to five bikes, it all depends on the make, model and capacity of the rack itself. Question: What is the weight limit of my bike rack? Answer: This always depends on the bike rack itself. The maximum weight is always written in the documentation which comes with the bike rack. Question: Is there a warranty on my bike rack? Answer: Virtually all bike racks come with some form of warranty protection, although this always varies from one manufacturer to another. Just like it has been stated above when reviewing the best 10 hitch bike racks available, most of the better quality bike racks come with limited lifetime warranties. Question: Is there a hitch bike rack style that will carry every style bike I might own? Answer: Not all style of bike racks can carry different varieties of bikes, and some bikes should not be carried on specific styles of bike racks, before purchasing a bike rack, you would first need to ensure that the rack is capable of carrying your bike. Question: Do I have to drill holes in my car to mount the rack? Answer: No, It is not necessary to drill holes in your car, you just need to mount the rack directly into your existing hitch. This means there is no need to drill any hole for any type of modification. Question: Is my vehicle able to have a hitch installed on it? Answer: This answer largely depends on the make and model of your vehicle. Most vehicles always have a trailer hitch installed by an auto shop, but not all of them can. It is advisable to check with an experienced auto mechanic first. Type and Style: After you must have decided that a hitch-style bike rack is the best option for you, you still need to select the actual style of the rack you would finally purchase. There are just three common types on the market. These platforms include; tray (holds your bike securely while traveling), hanging (the bikes would hang suspended from arms by their frames), and wheel only (the bike is suspended by the wheels in this case, not the frame). Bike Types: You have to ensure that the rack you intend on purchasing would be able to fit the type of bike/bikes you own. For example, a standard men’s bike would usually fit easily on almost any type of hitch based rack, but women and children’s bike may require special adapters, especially with some of the hanging racks available in the market. It is also quite possible that you would have a racing bike with a carbon fiber frame, which could be damaged by hanging from a racks arms. Weight: This is a really important consideration, and for different reasons, but the most notable of all is installation and removal. You should really consider how heavy the rack you are considering is. Is it a DIY (Do It Yourself) type? Can you easily install and remove it yourself? Is it considerably light enough for it to be stowed away in the trunk or back of your vehicle? Hitch Size: You would need to consider your hitch size because most hitch bike racks should fit a one or two-inch receiver. However, If you have a larger receiver (a Class V for instance), you might need to make use of an adapter, or might need to consider purchasing a different rack. If you have a Class I hitch, it might be better to buy a different type of rack entirely. Bike Capacity: How many bikes can the rack accommodate? If it’s you alone, or you and one other person, there are loads of choices you can easily select from. However, if you’re carrying bikes for the whole family, your options are more limited. This does not mean that you do not have any options you can select from, they are just limited. Folding/Storage/Additional Features: What other features and benefits do the rack offer? Does it fold out of the way so that you can access the trunk/tailgate/rear door? Does it have large pads to protect the frame of your bike from rub-related wear? What sets the rack apart from others on the market? Buy More Than You Need: Most times, purchasing a rack which is a little bit larger than what you believe is necessary is quite advisable. If you need a one bike rack, it is advisable to go for a rack that can carry two bikes instead. If you need a three bike rack carrier, purchase a rack which can contain four bikes instead. This would ensure that you have enough room for when your bikes are not steady, to avoid causing damages today any of the bikes. If you go for the exact number you need, you would discover that your bikes would end up been tightly packed together. Also, having some free space is never a bad thing. Know Your Payload Capacity: Whenever you are adding a bike rack to your vehicle, you need to be really cautious of your total payload capacity. For example, adding a rack, plus four bikes, plus four additional people, plus all their associated luggage could put you well beyond what your vehicle is rated to carry. Know the limits of your vehicle, and always ensure that you buy or plan accordingly. Never forget that you must always base your hitch purchase on the towing capacity of your vehicle, plus the hitches allowable tongue weight. These would go a long way in determining a great deal about your experience and also determine whether the rack would hold up or not. If you have an unusually shaped bike or a bike which has more than one seat (tandem) or an extra-long frame, it may need special consideration to be transported. 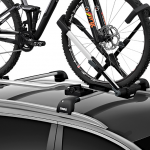 Depending on the bike, you may need to consider a roof rack, rather than a hitch rack. Most hanging bike racks available on the market can only secure the frame of the bike to the rack. This would leave the tires of your bikes free to spin, and the handlebars to turn while you are riding. It is advisable to invest in additional bungee cords or tie-down straps to prevent unwanted motion or damage as the case may be. Before you would need to pack up and leave, you should test the bike rack because some bikes do not fit well on hanging racks. After the testing, all you might need is just an adapter today allow the hanging arm to fit the narrower frame. This might be too late if no test run is carried out. After considering all the factors stated above, whether you then decide to go for platform style, hanging style or wheel style rack, the factors should be enough to guide you safely and securely on How To transport your bike/bikes anywhere you need your go. These are excellent for families that are heading out for their vacation and have decided to take their bikes along, this would also work perfectly for camping trips, or you require a weekend away with your bikes. Now, you should have all the necessary information you need it to discover the right hitch bike rack which meets up with your needs. Find out the number of bikes you are transporting, and then you can decide whether frame contact is a bad thing or not (frame contact is acceptable for metal frame bikes, but carbon fiber frames need extra protection and care). You would also need tops put into consideration, how important it is for you to access your rear/trunk door of your vehicle, the weight of your bikes and the type or style of bikes you would be transporting. After arriving at all these necessary information, you can now consider your options. We have been able to present 10 of the best hitch bike racks available in the market for 2019, and there are also lots of options available apart from this 10, with different features, benefits, and bike capacities. All you require is a little touch time to compare your options, and you can be assured of positive results. Even if you select out of the racks which have been compared for you.